Have you ever wanted to experience the army, only without all the fighting, getting up early, and everyone telling you what to do? Well, maybe the price tag on today’s Nice Price or Crack Pipe Jeep M715 will let you soldier on. Semantics are important in gauging how to conduct one’s life. Consider as example that while a “money pit” is a bad thing, a “pit full of money” is the exact opposite. You might not have needed the latter to pay the $7,500 asking price on yesterday’s 1978 Porsche 928, but that car’s restoration would likely be a different story. The consternation surrounding that state of affairs for the rare manual-equipped and Pasha upholstered Porsche resulted in an impossibly narrow vote, however the Nice Price advocates eventually won with a 52.86-percent finish. Yesterday’s 928 may have had a lot going for it, however consider these bonafides if you will— convertible top; 4X4 chassis; flatbed bed; military veteran; mud flaps. Yep, this 1968 Kaiser Jeep M715 has it going on. It also rocks a 230 cubic inch displacement Tornado six, which has the singular distinction of being the first mass-produced overhead cam automobile engine made in post-war America. Now, admittedly convertible pickup trucks are not a hugely well represented nor popular category. When Mopar Hassan chopped the Dakota back in the late Eighties to gain attention, they only managed to move about 3,600 of the hair tousling cargo haulers over three successive model years. In the Army however, you need to know when you’re standing tall before the man, and that’s why this M715’s soft top makes a lot of sense. The ad says that the truck did in fact serve its country. It did so at Ft. Bragg, the North Carolina Army installation that’s so big—250 square miles—that it touches four counties. A military base that huge demands vehicles to move stuff around it, and that’s where this M715 apparently came in handy. Kaiser based the go-anywhere carry-all military mover on the civilian-aimed Gladiator pickup, and the M715s came out of the same Toledo, Ohio factory as their non-conscripted brethren. In total, about 33,000 M715 were built over the course of its three-year run, from ’67 to’69. Changes from its Gladiator progenitor included enlarged front fenders to accommodate military tires, a removable soft top and fold-down windscreen, and a bull bar in front. Standard pickup beds were available, or, like this one, the M715 could be had with a flatbed. The drivetrain here consists of the aforementioned Tornado six, which puts out a stoic 133 horsepower and 199 lb-ft of torque. Behind that sits a four-speed Borg Warner manual which is more of a three-speed with a stump-puller low for when the going gets tough. A two-speed NP200 transfer case sends power to a Dana 60 axle up front, and a Dana 70 full floating axle in back. Leaf springs of the gods hold up the 1.25-ton capacity truck and probably provide ride comfort akin to a jackhammer. This M715 seems to have a lot going for it. The seller says it comes with new tires and top, and that it “runs like a champ!” There’s only 17,250 miles on the truck, although you can bet those aren’t all “highway miles.” There’s no apparent rust or rot, reflecting the truck’s southern station. These have 24-volt electrical systems which require two 12-volt batteries. But don’t worry soldier, those are said to be new as well. It’s also street legal and carries current Pennsylvania inspection tags. Keep in mind however that the top speed on this truck is a mild mannered 55 miles per hour. Don’t expect to make it a daily driver dicing it up on the highway. What would you use this for? Well, it’ll haul just about anything you want from the home center to your house. Not only that, but it will do it in style. Plus, you’d be in demand every Fourth of July and Veterans Day for parades and just plain showing off. What does this American exceptionalism cost? This one’s asking a mere $8,495. If you check around, pimped examples are asking a hell of a lot more. Here you get a very basic, and perhaps more appreciably authentic experience. 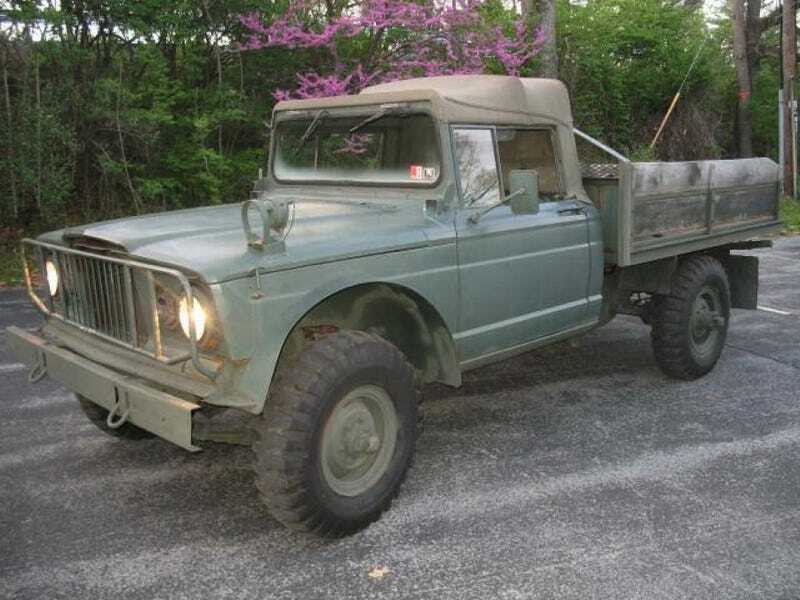 What’s your take on this classic former military truck and that $8,495 price? Does that have you saying “Yes Sir!”? Or, does that price feel totally FUBAR? Altoona, PA Craigslist, or go here if the ad disappears. H/T to Dusdaddy for the hookup! At $7,500, Could This 1978 Porsche 928 Have You Singing Wake Up Little Butzi?